Jaguar’s legendary test driver Norman Dewis OBE is to host a special tour to the famous Hotel de France between October 28th and November 1st. 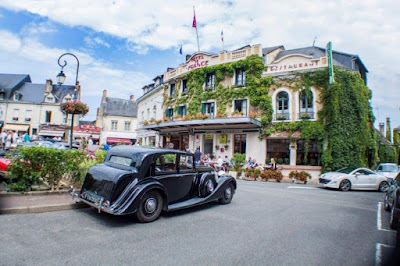 Drivers will be able to join Norman on a 5-day trip that will take them to the circuit at Lohéac, the famous motoring hotel, where they will spend three nights, and Le Mans, where he raced for Jaguar. The tour is being run by specialist tour operator Classic Grand Touring and spaces are still available. On Saturday evening, after a day of driving and visits to the principal chateaux in the Loire, Norman will talk about his experience with Jaguar, driving in the Mille Miglia and delivering the E-Type to the Geneva Motor Show in 1961. Situated in the town of La Chartre-sur-le-Loir, around 40km away from Le Mans, the Hotel de France is famous for its long association with motor sport and the Le Mans 24 hour race. From the 50’s to the 80’s, many drivers such as Stirling Moss, Caroll Shelby and Derek Bell, and victorious teams would use the hotel as headquarters, preparing their racing cars in the courtyard and then driving them to and from the circuit on public roads. The Loire Valley is famous for its picturesque towns, chateaux and country roads, which are regarded as some of the most beautiful in France. Drivers will have the opportunity to visit these magnificent chateaux as well as enjoy sampling at the local vineyards. Tour package includes return sailing from/to Portsmouth with Brittany Ferries, three nights at the Hotel de France on a half board basis, all visits and transfers described in the itinerary, services of an experienced tour manager. 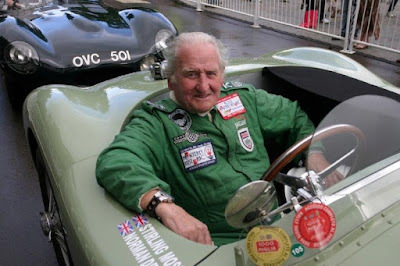 Norman Dewis, as Jaguar’s chief development test engineers, has spent 36 years deciding how the company’s cars should feel to drive. Intimately involved with the development and testing of all Jaguar models, Norman hails from the golden era of Jaguar when the factory not only produced a stream of elegant, high performance luxury saloons and sports cars, but could also build equally elegant – and extremely successful – race cars. After his retirement in 1985, aged 65 he has acted as an ambassador-at-large for Jaguar, attending events worldwide. He has been associated with Jaguar for more than 60 years. The achievement he is proudest of is developing the disc brake with Dunlop, an innovation that has saved countless lives over the years.